Family Lore: "Do your kids a favor – don’t have any." Convicted father precluded from having contact with his children - The case ZX, R (on the application of) v The Secretary of State for Justice. 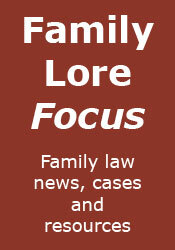 Family law and the ‘non-conventional’ family - As in Re B. Child benefit and the ending of child support liability - The case DJ v Secretary of State for Work and Pensions and TJ (CSM) (Child support - receipt of benefit). Can a parent be forced to have contact? - I answer the oft-asked question.